Nexon’s BnB M is one crazy multiplayer game. Gameplay reminds me of Bomberman, although this game is a lot more fun. You will have to place water balloons on tiles to trap your opponents and then collide with them to earn points. As simple as it sounds, BnB’s PvP matches are extremely fast paced and challenging. You will have to employ various strategies, use traps and try your best not to fall into their “bubble traps” to win a multiplayer battle. The game offers unique battle arenas, each having a different layout full of obstacles and traps. You will have to be smart enough to destroy blocks so that you can trap your foes on the other side of these obstacles. Items will be hidden under blocks and you will have to place water balloons beside blocks to unearth them. You can then use these items to your advantage to earn star points. Using the virtual joystick, move your character towards a block and tap the water balloon button to place a balloon next to it. The balloon will destroy the block when it explodes. Now move away from that balloon if you don’t want to get trapped in it. When you place it, you will see the water balloon’s “explosion radius” through highlighted tiles. A water balloon explodes after a short time, and a character within its explosion radius, as shown by the highlighted tiles, will be trapped in a bubble soon after it explodes. You will have to quickly move to a tile which isn’t highlighted to be safe from an explosion. You will have to steer away from all water balloons placed by you, your team member or your opponent to avoid being trapped. Keep this mind when you are within the range of your team member or your own water balloons. If your team member is trapped in a bubble, run into him to free him. He will be freed from the bubble trap when you collide with him. Do the same with an opponent’s character and you will take him out to get a star point. Your opponent will also try to do the same. It will take a few seconds to respawn in an arena when your enemy collides with you. If you have unlocked two or more super skills, you can select a skill just before respawning. You will be respawned on a random spot on the battlefield. When you respawn, you will temporarily become invincible and all your stats will be maxed out for a few seconds. Take maximum advantage of this. In a multiplayer match, your team’s goal is to earn a star point by trapping enemies in bubbles and then colliding with them to take them out. A team wins when it earns all 5-star points. A team also wins when its star points are more than the opposing team’s star points at the end of the battle. Simply speaking, when the timer hits zero, the team with the most star points win. This should be done at the start of every battle so that when most obstacles are cleared, it will be easy for you to trap your opponents and avoid being bubble-trapped by them. In every battle arena, items are hidden inside blocks. When the game begins, you will notice a labyrinth of blocks. Make sure you destroy all blocks near you and collect items hidden in them to increase your balloon count, speed and the explosion radius of your water balloons. You will notice your stats for balloon count, explosion radius and speed increase when you collect these items. You may also stumble upon rare items such as UFOs, mounts and speed boosts. Take maximum advantage of these items to vanquish your foes. BnB M is a team game, so you should definitely know what you are doing and how are you trying to help your team. If a team member or your friend is busy lining up water balloons to trap enemies, you should wait out until an enemy is trapped and quickly collide with him to gain a star point. If both of you are busy placing balloons on a battlefield, then it will surely lead to some confusion. Bear in mind that you can also be trapped in your team member’s water balloons. Blindly placing balloons will lead to more confusion and will ultimately benefit your opponent if they are smart. Just make sure you clear any obstacle in front of you, help your team mates when they are trapped in bubbles by colliding with them and look for colliding opportunities against your opponents. If you see blocks behind your opponent or if the opponent has reached the edge of a battle arena, you can “balloon-trap” him by placing more than one water balloons vertically on tiles in front of him. Doing this, he won’t be able to move as there’s a dead-end or a block behind him and two more water balloons in front of him. This way, he will be trapped and then bubble-trapped as soon as balloons explode. You must be close to your opponent, away from the explosion radius. When he is trapped, collide with him to earn a star point. Balloon-trapping works best when your opponent is trapped by blocks on all three sides or when he is at the edge of the battle arena with two blocks on his left and right. It won’t work if he has just acquired items such as “gloves” and “baseball bat”. They are used to push/smack water balloons away. 4. When Should You use the Needle? A Needle frees you when you are trapped in a bubble and plays a very important role in battle, only if you know when to use it. You should use a needle on two occasions – When you see an enemy nearby and when there’s another bubble-trapped enemy close to you. Sometimes, both you and your enemy get accidentally trapped in your bubbles and are near each other. This is the right time to use a needle to free yourself. When you are free, quickly collide with your enemy to gain a star point. Needles costs 20 coins and you should take at least 5 needles with you to a multiplayer match. A needle and an arrow are two crucial gear that can turn the tide in favor of you. The arrow is used to take out enemies from distance. It costs only 15 coins. Use it when you need star points the most. Water Balloons: Obtaining water balloons will let you place more water balloons at once. The balloon stat on the bottom of the screen shows how many balloons you can place at a time. Max out stats by collecting water balloon items and you can place 5 balloons at once. Potions: Increases your water balloon’s blast radius. The more potions you collect, the bigger the blast radius. A bigger blast radius of your water balloons will help you target enemies from a distance. Speed Shoes: Collect speed shoes to increase your speed. In a fast-paced game like BnB M, you should move fast to avoid getting trapped in a bubble. Look for golden shoes with wings on them. These are “speed boosters” that maxes out your speed for a few seconds. Ghost: It is one of the rare items. If you find it, you will temporarily be invincible in a few seconds. Mount items: Look for feathers and turtle backs and collect them. These are mount items that let you ride turtles or birds. If you are struck by an exploding water balloon wgile riding, your mount will be destroyed first so you don’t have to worry about being trapped in a bubble when you are riding a mount. Tip: Riding a turtle greatly increases your speed. UFO: You might find this item hiding within blocks. When you ride a UFO, you can move over blocks, and if you are struck by a water balloon, then the UFO will be destroyed first. Those were some key items you will find on a battle arena. If you find some more, please let us know via the comments section. When your friend or team mate is trapped in a bubble, a “Help” callout will appear above him. Quickly collide with him or use the arrow to free him from the bubble trap before your opponent collides with him to gain a star point. You and your team mate’s focus should be to avoid getting trapped in bubbles as much as possible, and so you should help each other. When you are trapped, tap the balloon icon on the lower-right corner of the screen to call for help and a distress signal will appear above your trapped character. Your friend should be colliding with you or using an arrow item to free you from the bubble trap. As you keep playing BnB M, you will unlock new characters. After completing a set of tutorials, you will unlock the red character “Dao”. Bazzi will be already be unlocked for you. Each character has his/her own strengths and you should keep this mind when you select one. You can check a hero’s special abilities and stats by tapping “Character” on the home screen. For example, Dao has a unique ability where he temporarily gains shield when you free a teammate from a bubble trap. OTOH, Bazzi’s speed temporarily increases when he escapes from a bubble. Along with abilities, you should also keep a check on their stats Count, Blast and Speed. Count suggests how many balloons you can place on tiles at a time, whereas Blast is the explosion radius. Speed shows how fast your character is. Each character’s stats value will be different from the other. For example: “Dizni’s” balloon count stats is a bit higher than Uni’s balloon count, whereas Uni’s Blast stats are higher than Uni’s Blast stats. You can upgrade your character’s stats using a certain number of pieces of the same character and coins. To unlock a character, you will need a certain number of pieces, which you can get from the “Piece” gacha. Head straight to characters and tap a locked character’s portrait. Next, tap “Piece Gacha” button and under “Character Gacha” tap “Free” to get a character piece. The pieces you get can also be ground to get powder, which can then be traded with a character piece of your choice. Just tap “grind” below a character portrait and then use coins to turn all pieces obtained into powder. Super skills can be a game changer. 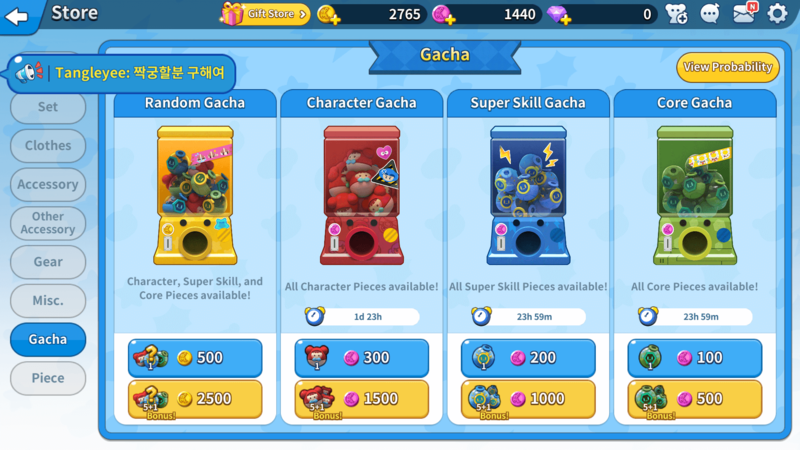 There are 10 different types of super skills and each skill is different from the other, you can obtain a super skill piece via “Super Skill Gacha”. Collect all pieces to unlock a super skill and use it during battle. Go to store and then tap the Gacha button to get a list of vending machines for characters, skills and cores. Know a super skill’s power before equipping it. Go to “Skill” and then tap a skill button. Now tap “Training” on the right side of the skill to know how it works. You will also be rewarded with coins when you complete training. Before equipping a skill, think how is it going to be useful in battle. If you want to earn star points quickly, then you should choose attacking super skills, such as the guided torpedo or the water cannon. Both these skills have the ability to bubble-trap your opponent’s directly without using any water balloons. There are several more, including the most devastating dummy bomb that lets you place a bubble- trapped dummy and if any enemy tries to collide with it, he/she will be trapped in a bubble. Each skill has a cooldown time, which can be decreased if you upgrade them. To upgrade a skill, you will need pieces of the same skill, which can be obtained from the skill gacha and coins. Play the single-player “Treasure Island” against bots to earn lucci. It has a board game-like look and feel. Login daily. Also, get coins from the toy crate. 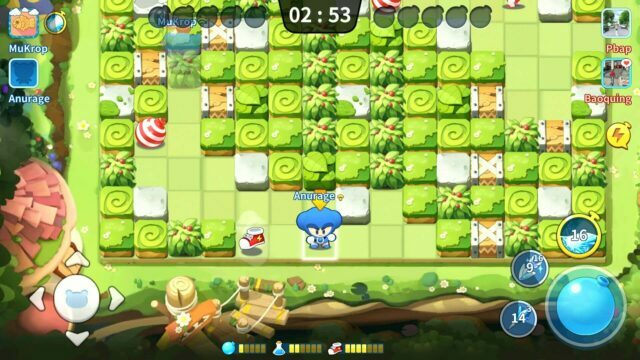 Tap the crate located on the upper-right corner of the screen. Play the normal or ranked multiplayer match and win it to get lots of Lucci. You will receive half the prize or less if you and your team lose. 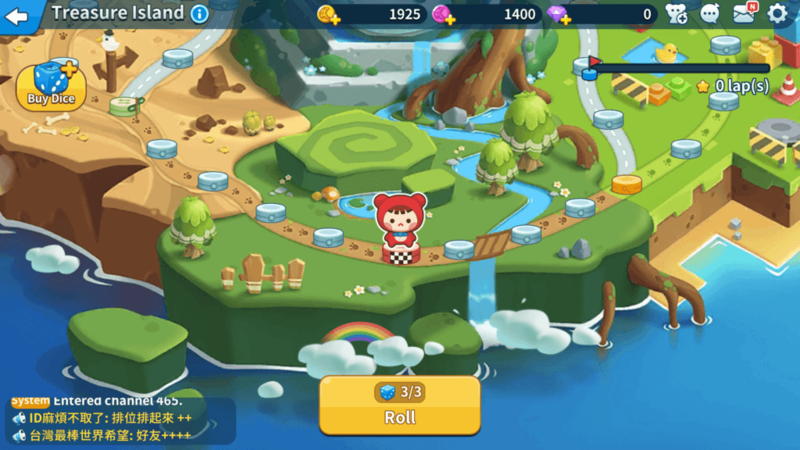 Complete main and daily quests to get gold and purple lucci. Tap Bazzi’s portrait on the lower-right corner of the screen to check a list of quests. Don’t forget to claim your rewards.